Left: Farwest Show attendees gather outside in the lobby of the Oregon Convention Center. Top right: Colleagues network at Pub Crawl. Bottom right: Guests photograph displays at the Little Prince of Oregon booth. 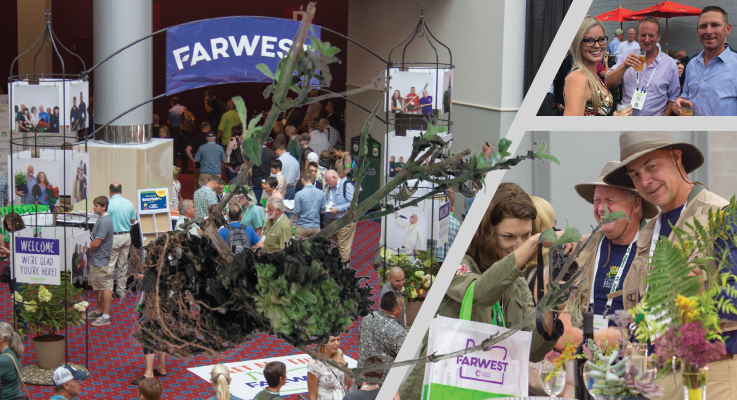 Growers, landscapers, retailers, brokers, landscape architects, educators, service providers and suppliers came together for the 2018 Farwest Show, held August 22–24 at the Oregon Convention Center in Portland. Some were new to the industry, while others have been attending or exhibiting since the show was founded in 1973. Every age and experience level could find something of interest. But regardless of that, this year’s Farwest Show was a remarkable convergence of about 5,000 green industry professionals representing 28 countries and 45 states. 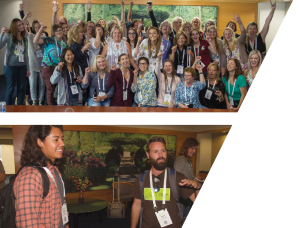 Top: Women in Horticulture connect at the Farwest Show. Bottom: New professionals share ideas at the Emergent group gathering. All were there for three principal reasons: to learn, to network, and to do business together. They gathered in the third-biggest nursery state (by sales) in the United States and experienced what is by far Oregon’s largest segment of agriculture. Oregon growers sell nearly $1 billion worth of green goods annually, and roughly 80 percent of those Oregon-grown trees, shrubs and plants are destined for out-of-state and international markets. The Farwest experience included four key components — learning, networking, experiencing and buying/selling. Ali Noorani delivers his keynote address. Learning. 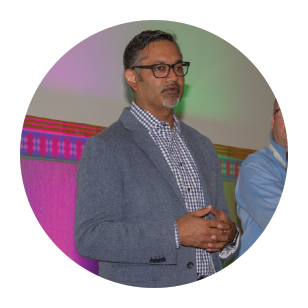 Attendees chose from some 43 hours of educational seminars and mini-sessions, including the Farwest Keynote by Ali Noorani, executive director of the National Immigration Forum. His address, “Leading the Way: A New Approach to American Immigration,” explored ways in which the intractable stalemate over immigration law may, with effort and time, be broken. Other seminars covered every facet of the green industry, from plant trends to succession planning to automation to irrigation and even human resource management. Nearly 12 percent of Farwest attendees attended at least one seminar. Networking. A series of events provided attendees many opportunities to build valuable new connections with other industry professionals. The Farwest Happy Hour closed the first day of the show, while the legendary Farwest Pub Crawl sampling Portland’s beer scene concluded the second day. Also popular were the Emergent: A Group for Growing Professionals reception that focused on industry people under 40, and the Women in Horticulture networking event. Left: Mickey Hatley, Northwest Farm Credit Services, moderated a talk about succession planning. Right: New Varieties Showcase featured 62 plant introductions. Experiencing. Three showcases let Farwest attendees experience the very newest and best in plants, products and consumer trends. The New Varieties Showcase included a record 62 outstanding new plant introductions, from annuals to perennials to shrubs to grasses to trees, inspiring discussion about which was the most exciting. Attendees cast more than 1,800 votes for their favorites. The New Products Showcase highlighted innovative new products for the industry. 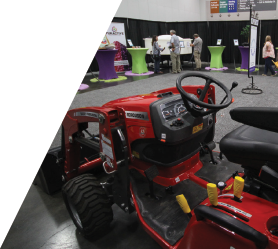 The New Products Showcase included 13 products designed to enhance operations and profits at the wholesale or retail level, from equipment to fungicides to pottery and even innovatively packaged plants like the Instant Hedge. And the Growing Trends Showcase, featuring a tiny house and surrounding garden, synthesized numerous trends in one appealing package. “At a time when consumers are becoming sustainability minded, growing more edible plants, getting more water efficient, shrinking their carbon footprint and getting in tune with nature, the Growing Trends Showcase captured it all,” Niemi said. But experiences weren’t limited to the show floor. 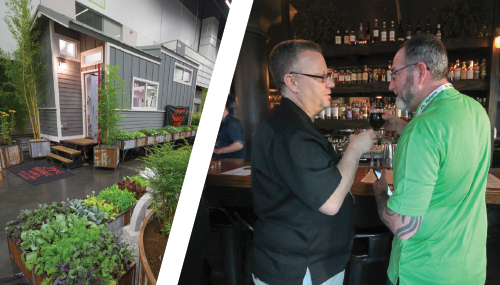 Pre-show tours demonstrated the innovation that Oregon’s retailers, tree growers and energy-efficient nurseries are bringing to the table in 2018 and beyond. Buying and selling. Perhaps most important of all was the core of the trade show — the expo itself. Close to 400 exhibitors showed their best offerings, with many investing extra creativity and innovation, not to mention farm-fresh plants, to bring their booths to life — and also bring attendees’ camera phones out of their pockets. Left: Thimble Homes LLC constructed a custom tiny house for the Growing Trends Showcase. Right: Farwest Show committee members Dale Parra and Robb Sloan congratulate each other for a good Farwest Show. To name just a few, Bamboo Garden’s booth was a densely packet thicket of trunks and leaves, while Hopper Bros. packed their booth with conifers of every size, shape and color, and Little Prince of Oregon Nursery lured in customers with creative use of plants in a fishing-themed booth. Iseli Nursery put together a conifer island to rival any. The most creative exhibitors reported that their creativity paid off in the form of greater interest from show attendees.